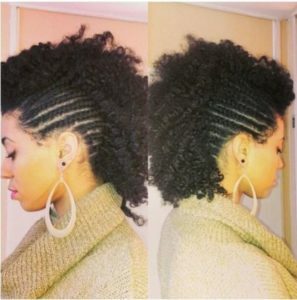 The frohawk is an extremely popular hairstyle among women with natural hair. In addition to being cute and edgy, this hairstyle is also very easy to create. 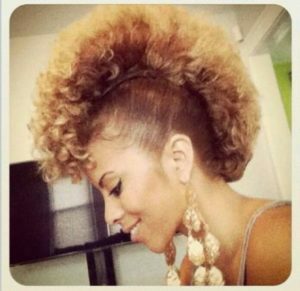 Frohawks look great on any length of hair (short, medium, or long) and any hair texture. The best part is that no two frohawks are exactly alike. 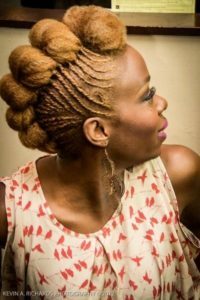 There are a variety of ways to style a frohawk, which gives the style a surprising amount of versatility. 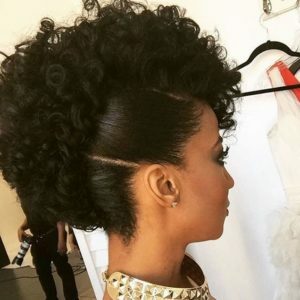 Creating a frohawk is a relatively simple process and there is more than one way to do it. 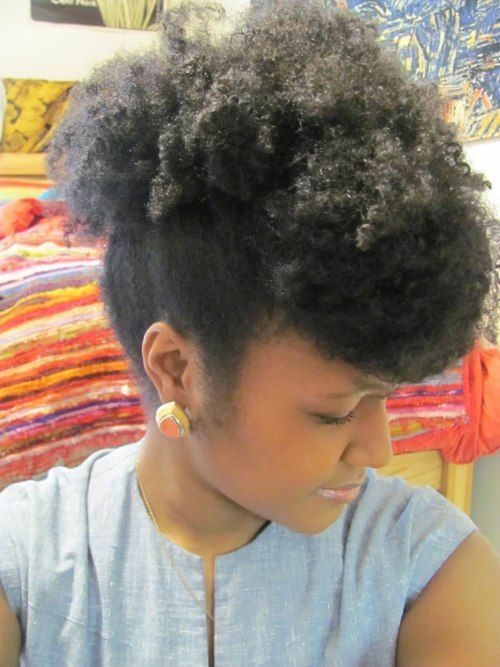 The ultimate goal is to gather your hair towards the center of your head from front to back. The easiest way to do this is to start by dampening the sides of your hair and applying a gel or pomade to help slick the hair up. Using your hands and/or a boar bristle brush, gently smooth the hair upwards towards the crown of the head and secure with bobby pins. Repeat on the other side. 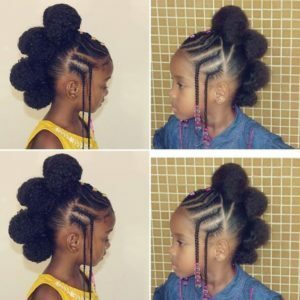 If you decide to use a brush, be very gentle to avoid breakage. The method you choose will ultimately be determined by the exact look you’re going for, your unique texture, and the length of your hair. Here are 40 ways to style a frohawk. This frohawk is created by cornrowing the hair up towards the crown of the head. 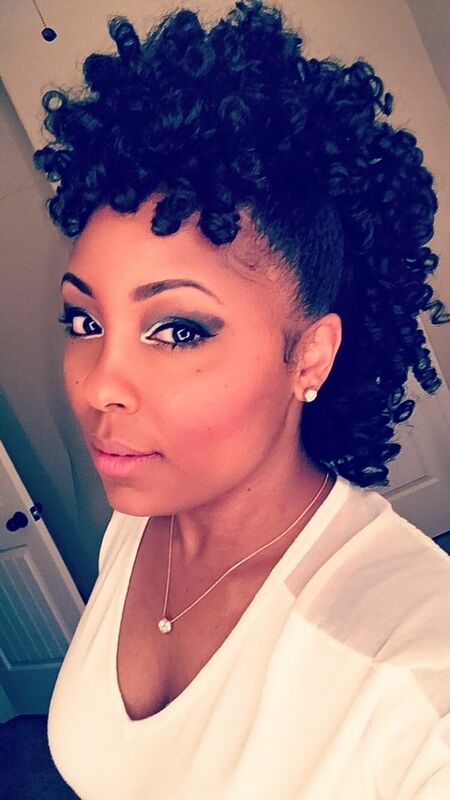 Perm rods or flexi rods can be used to create pretty spiral curls like the ones pictured here. 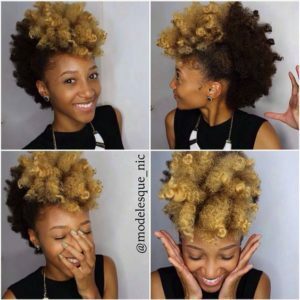 This golden-colored frohawk is created by flat twisting the hair along the sides of the head. The remaining hair is split into sections and tucked and rolled into buns going down the center of the head. 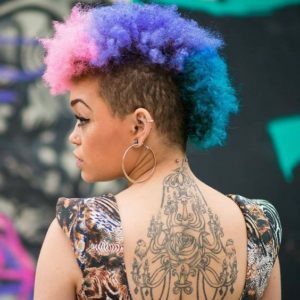 This fun, colorful frohawk is sure to turn heads. The hair is dyed three different colors for a whimsical look that is sure to conjure up visions of unicorns. The shaved sides create the perfect contrast against the soft, fluffy texture of the curls. You don’t have to have long hair to rock a great frohawk. 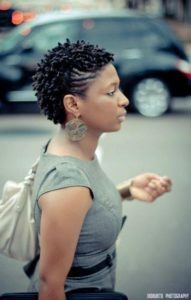 This cute frohawk looks great on short hair and is easily accomplished by flat twisting the hair up towards the crown of the head. This frohawk features a pretty cornrowed design along the sides of the head. The braids create a nice contrast that helps your natural texture really pop. This sleek frohawk is created with a chunky braided pretzel bun. 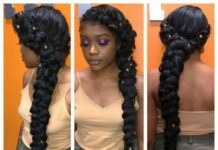 This look can be created with or without added hair. 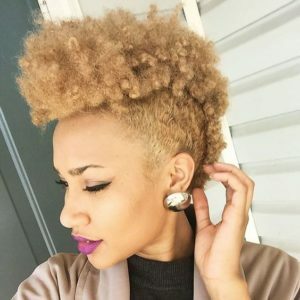 This is another great frohawk style for ladies with short hair. 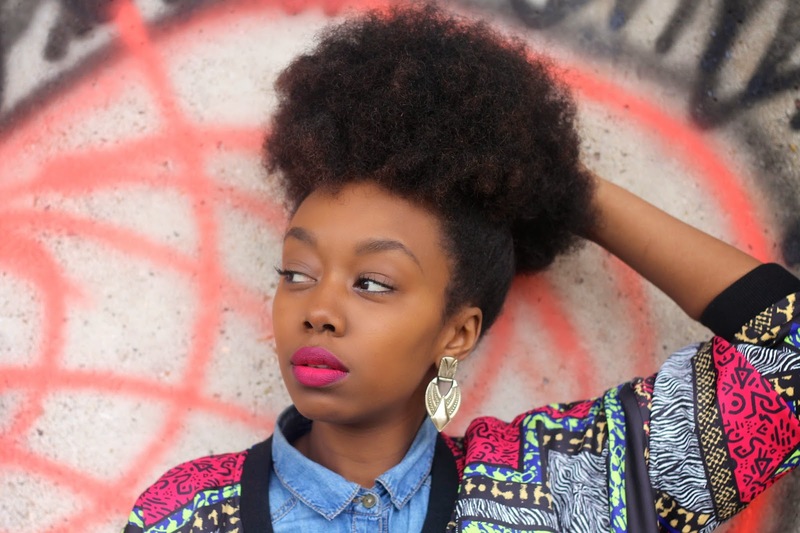 This look works best if your hair is already styled into a tapered cut (shorter on the sides). 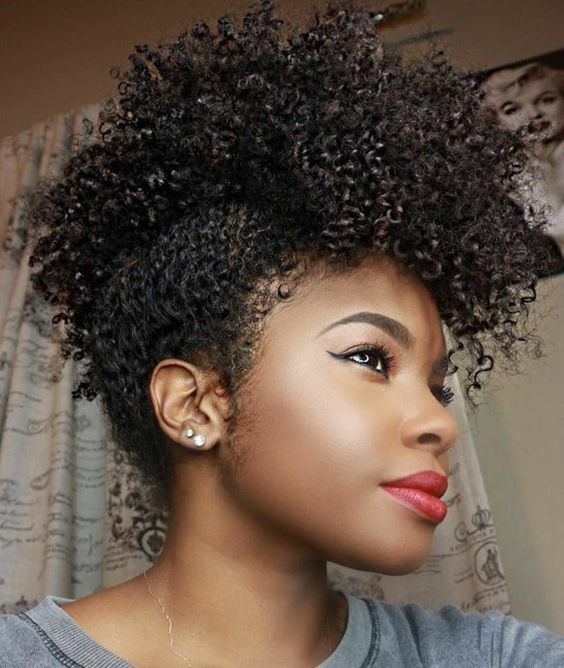 All you need is a little gel and a few bobby pins to create this look in just a matter of minutes. 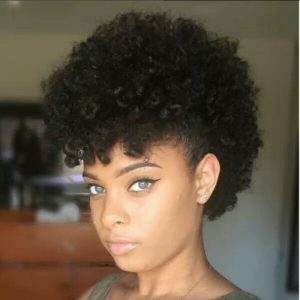 This is a great frohawk style for straightened hair. A curling iron or rollers can be used to create loose, voluminous waves. 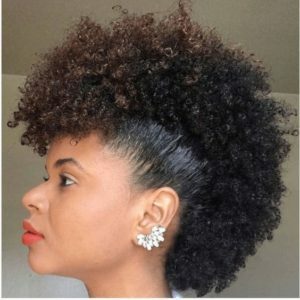 This style is easiest to achieve on hair with shaved sides. This tapered cut naturally takes on a frohawk silhouette without any manipulation. The longer length and pop of color in the front really make this style stand out. This is the perfect frohawk look for the ladies with thick hair. 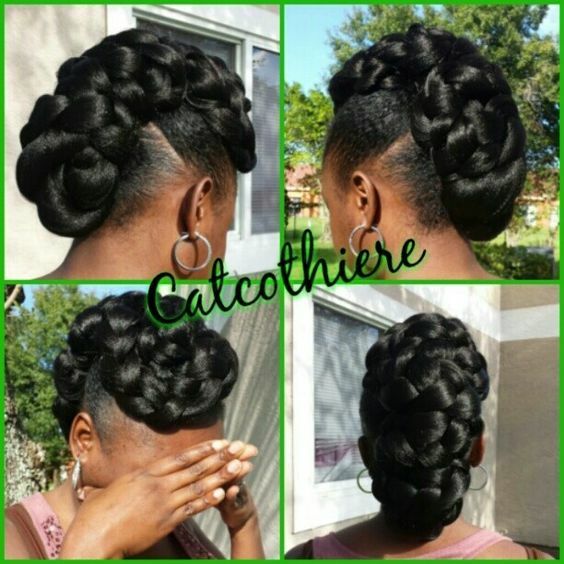 This style can be created by tucking, rolling, and pinning the hair down with bobby pins. 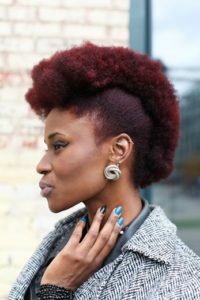 This gorgeous red frohawk is a great look for short to medium length hair. 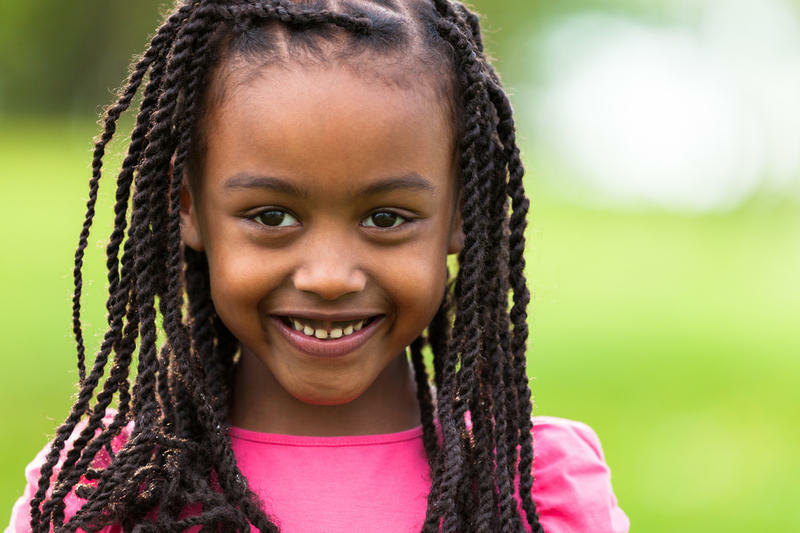 Use bobby pins or a banana clip to hold the hair in place. This frohawk is a quick, easy way to style your twistout. 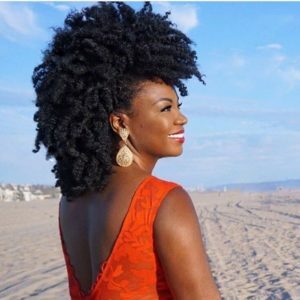 Because your hair is in a stretched state, it’s much easier to slick up towards the crown of your head and pin in place with bobby pins. 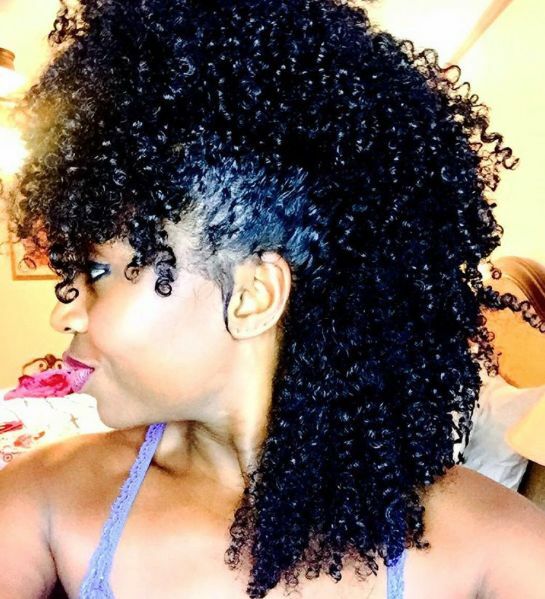 This curly frohawk lets your curls flow freely. The curly sideburns can be created by adding a little hair gel and twisting the hair around your finger. This frohawk is a great way to bring a days-old hairstyle back to life. 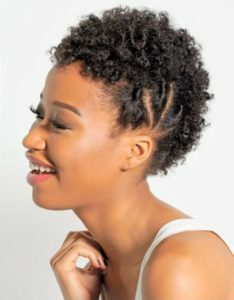 Stretched hair gives the frohawk added length and a slightly different texture. This look is more a modified frohawk style. It can be achieved by pulling the hair into a high puff, leaving out a section in the front. Take that front section and style it into a pompadour bun. This frohawk stands out because of its unique feathered look. 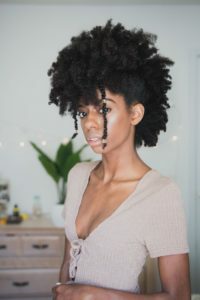 This style works best on stretched hair or hair that’s been straightened and lightly curled with a curling iron or rollers. 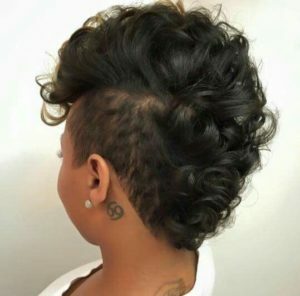 This is a fun, chic way to rock a frohawk on short hair. 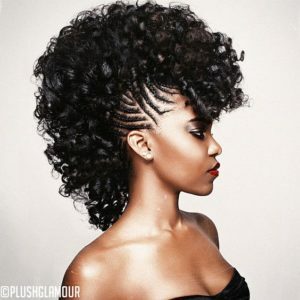 The cornrows on the sides create a great shape and allow your natural texture to take center stage. This curly frohawk can be done on a simple wash n go. The resulting look is sleek, sophisticated, and chic. 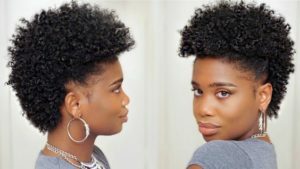 For this style, the hair is split into three sections. 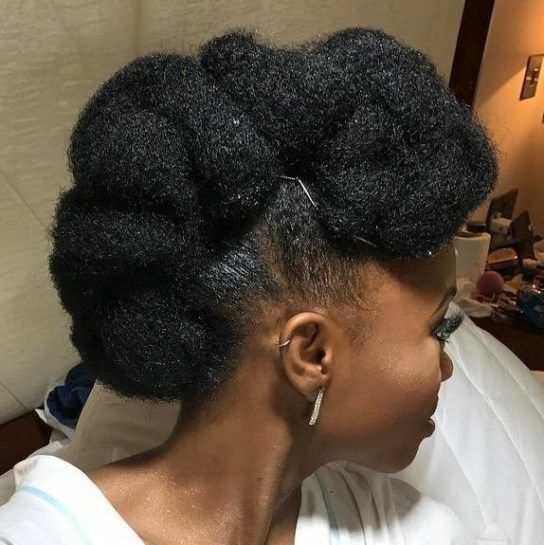 Each section is then styled into a bun for a truly unique frohawk look. 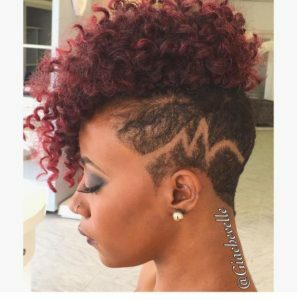 This funky red frohawk is bold and beautiful. The shaved design on the sides of the head really give this look an extra edge. 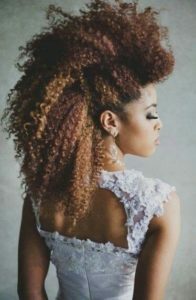 This gorgeous frohawk is created by sectioning the hair and essentially creating several high ponytails going from the front to the back of the head. Bantu knots can be used to create curls like these. This frohawk style is a great choice if you want to keep your ends protected. 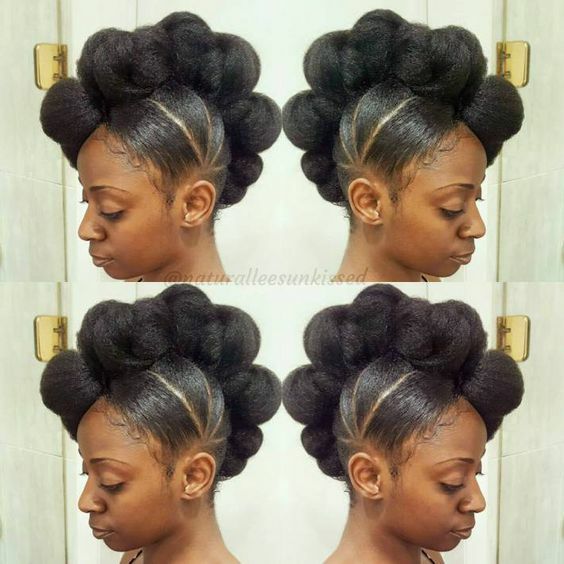 You can create this look by tucking and pinning the hair into several buns down the center of your head. This gorgeous textured frohawk proves that you don’t need gel and slicked sides to create a beautiful frohawk shape. A few bobby pins are all you need to create this larger than life look. 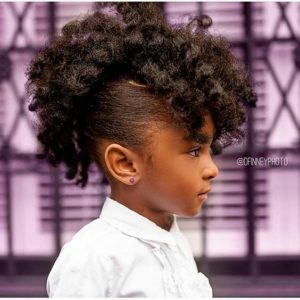 This is the perfect frohawk style for your little one. 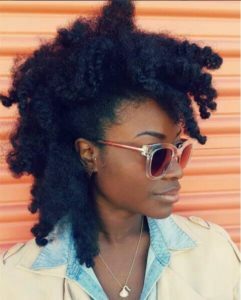 The hair can be stretched by doing a twistout or Bantu knot out prior to styling to make the process easier. Two strand twists frame the face in this style, giving this frohawk a unique look. 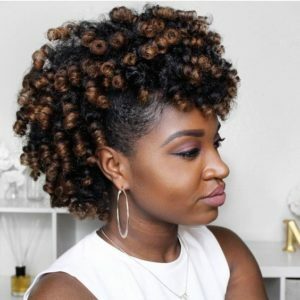 This cute curly frohawk works well on longer lengths. 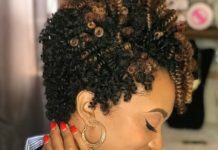 It’s a great way to modify a wash n go and an easy look to create. 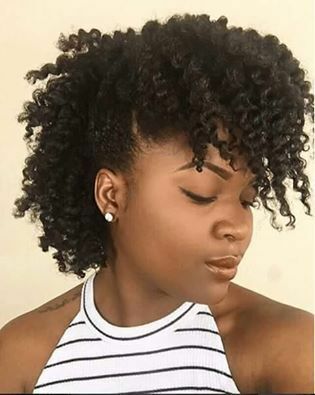 Perm rods can be used to create these tight spiral curls. Gently brush the sides up towards the center of your head and pin into place for a quick, easy frohawk look. This gorgeous frohawk style can be created with the help of perm rods. 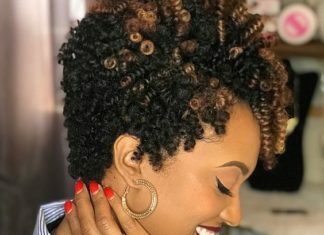 The light color on the ends contrasted with dark roots really make these curls pop. This a cute style for kids and adults alike. The hair is split into sections and tucked, rolled, and pinned into buns going down the center of the head. 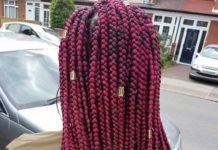 The bangs are styled into multi-directional cornrows adorned with beads. 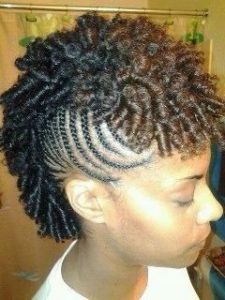 For this style, the hair is cornrowed up towards the center of the head. The ends are curled with perm rods, creating tight, pretty, uniform curls. 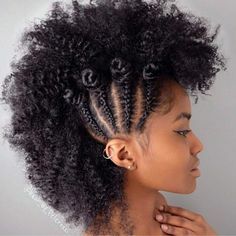 Rows of neat flat twists give this frohawk a unique look. 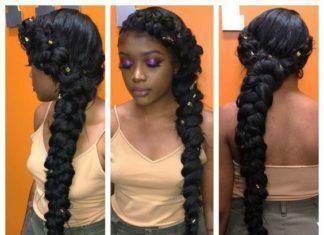 Two strand twists and/or flat twists can be used to create curl definition on the hair that’s left out. 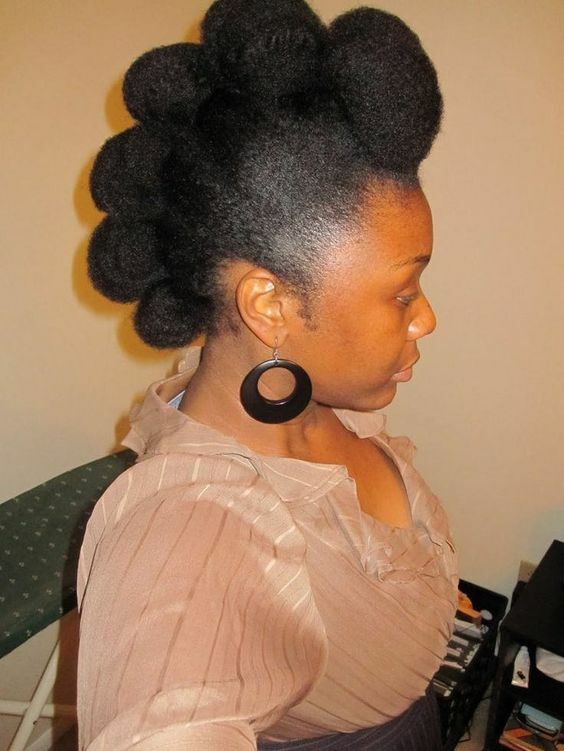 This frohawk can be done on hair that’s been stretched or straightened beforehand. 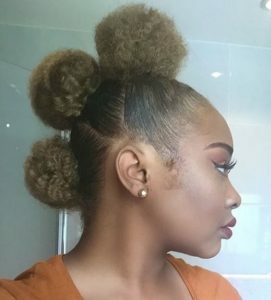 Separate the hair into sections and create multiple buns down the center of the head, securing with bobby pins. 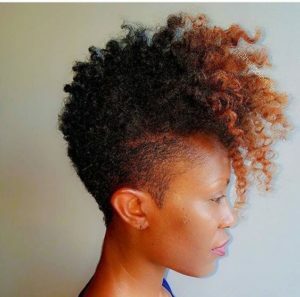 This sleek frohawk is perfect for special occasions. The hair is secured smoothly and firmly towards the center of the head, displaying a plume of beautiful curls. 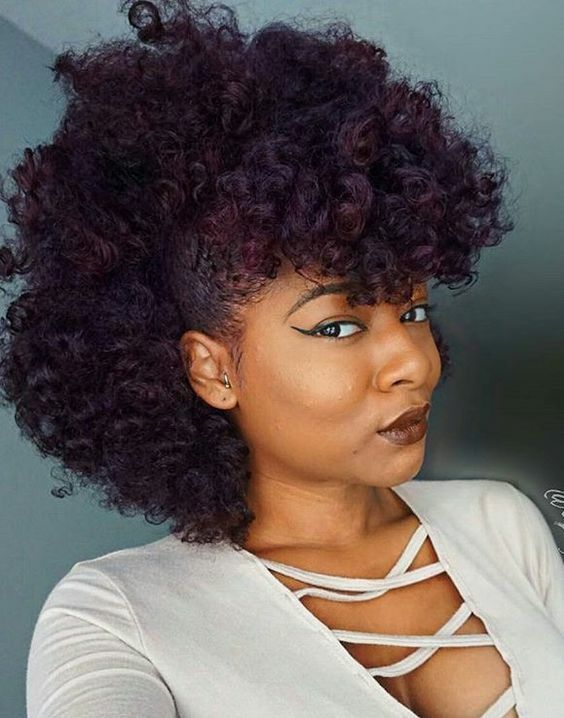 The highlight of this style is its gorgeous purple color. 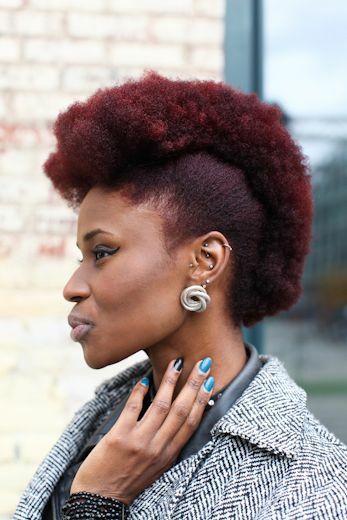 The dramatic look of the frohawk is the perfect way to show off a bold hair color. 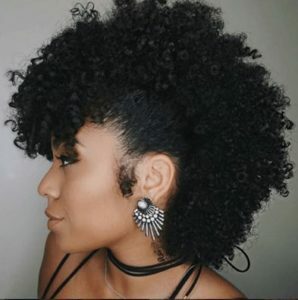 This frohawk is a great choice for long hair. 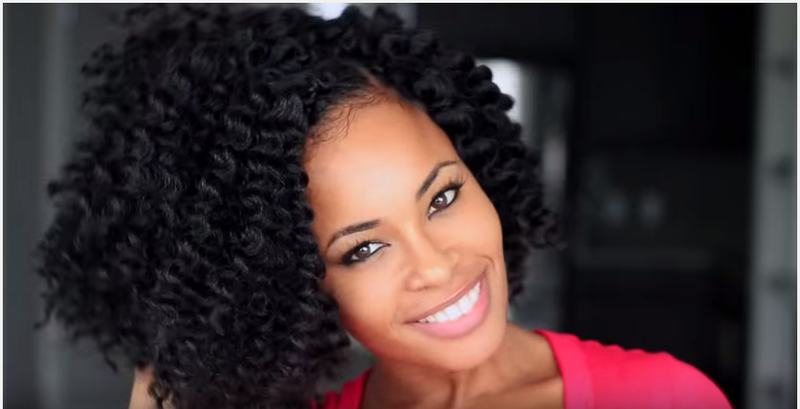 A perm rod set helps create tight spiral curls which flow down the center of the head. This is another great way to highlight a bold hair color. 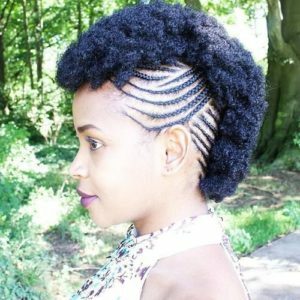 This style looks great on short to medium length hair. It’s an easy way to take a super defined wash n go to the next level. 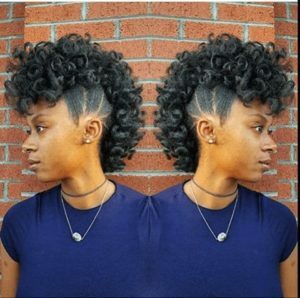 This edgy frohawk is sure to turn heads. 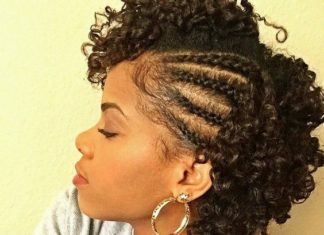 Cornrows are braided up the sides of the head and the ends are twisted into Bantu knots. This pretty blonde frohawk looks great when accented with a bold pair of earrings, as pictured here. This long frohawk is the perfect style if you’re going for a more dramatic look. Use bobby pins to pin the hair up along the sides and fluff and style with your fingers. If you have dyed bangs, a frohawk is a great way to show off the color contrast. 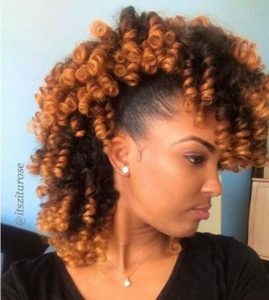 The result is cute, curly two-toned look that’s perfect for any occasion.